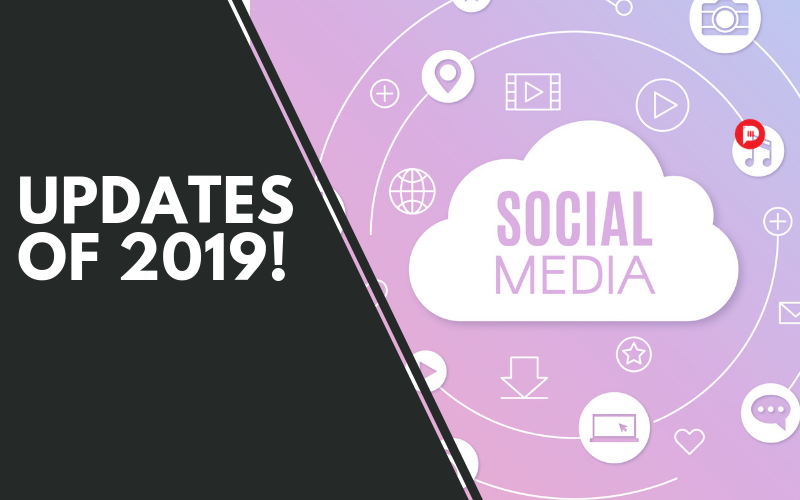 You are at:Home»Digital»Top Social Media Updates of 2019 you Need to Know! Another year, with another round of updates! Were you on top of all your social media platform updates, news and stories this year? As always, social media is constantly evolving, with new tools and features adding in and in better ways to connect your audience. Here’s a rundown of the big updates from each platform over this year. Now to access the camera you simply need to swipe left. You no longer have to look for it under a tweet composer button. After you take a picture/photo, you can add a short description, hashtag or location tag. The way the media will be shown on your timeline has also changed. The media captured with the Twitter camera will be highlighted, with the text under the actual photo. This feature is clearly aimed at encouraging people to report on things that are happening in real time through pictures and videos. Twitter is an amazing platform for lively discussion. Twitter is currently working on a feature which would enable users to follow certain Twitter threads by hitting a ‘Subscribe to conversation’ button. Twitter has rundown the most anticipated events of 2019 in its marketing calendar. Making it easier to plan your campaign strategy with Twitter’s most trendy topics. Ad relevance score offered advertisers a level of insight into how well their ad would perform and define the ad reach of a brand. Facebook plans to replace this score by several metrics which will be more actionable. Quality ranking: Measures an ad’s quality compared to ads competing for the same target audience. Conversion rate ranking – Shows an ad’s expected conversion rates when compared to ads with the same optimization goals and audiences. There were a lot of updates for Facebook Ads manager last month, in addition to the metrics, Facebook announced changes to its targeting options for some companies. From now on housing employment, credit ads, insurance ads can no longer be targeted by age, race, religion or gender. Facebook removed thousands of categories from targeting related to classes such as race, ethnicity, sexual orientation, and religion. Instagram’s currently testing out a new feature with selected retailers in the US, which would enable brands to sell products right within the app. The feature is titled ‘Checkout on Instagram. Instagram is planning to introduce a new format for promoted posts by influencers called ‘Branded content ads’. Until now, brands would hire influencers to work on ad campaigns and promote products with branded content, but the posts would only reach the followers of that influencer and their audience. Branded content ads would enable the advertisers to promote these influencer posts, the same as they would any other post. This would give brands more opportunities to maximize the posts produced by Instagram personalities as a part of their influencer marketing strategies. This would increase the number of reaches which may have a different set of audiences. LinkedIn updates Ads to improve targeting; partners with Adobe. LinkedIn has caught a similar vibe as Facebook and decided to give their Ads a fresh look for the spring. LinkedIn announces new data partnership with Adobe to improve ad targeting and accelerate account based experience. Pinterest, which is moving towards an IPO, continues to update its ad tools, announcing a range of new tools including its new Product Catalogs option. Shopping Ads – Shopping Ads are now available to all businesses through Pinterest’s Ads Manager. Once products are on Pinterest, brands can promote items from their existing product feed with Shopping Ads. As always, a range of new considerations and tools will have significant impacts on many businesses. It is always worth keeping up with the latest trends and features to be on top of your businesses. Next Article Amazon’s Advertising Strategy: A Learning You Shouldn’t Miss!